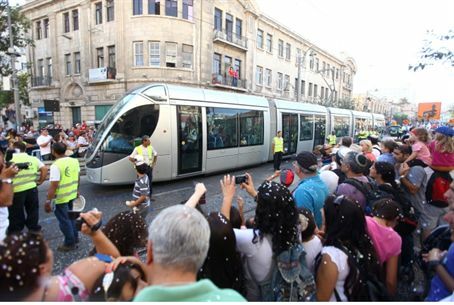 More than 100,000 people greeted the new light rail train on the main street of Jerusalem for the first time during the annual Sukkot march..
More than 100,000 people marched in downtown Jerusalem on Tuesday in the annual Sukkot March that this year also marked the completion of track laying on the city’s main street for a new light rail system. The event took place on the day before the end of the seven-day holiday of Sukkot and the beginning of the holiday of Simchat Torah, the "Rejoicing of the Torah." After years of work, Rehov Yafo (Jaffa Street) was the venue for the largest-ever Jerusalem March held in the city. The theme of this year’s event was “Downtown Returns to the Citizens,” referring to the years of construction which effectively made the center of town almost impassible, and marked 100 years of public transportation in Jerusalem. For the first time in the history of the city, a light rail train slowly traveled down the main street, accompanied by marchers and a parade of other vehicles that for a century had carried passengers through the streets of the ancient capital. Horse-drawn wagons, carriages from the Ottoman period, “Connection” vehicles and Egged buses from the days of Israel’s War of Independence period all traveled down Jerusalem’s main thoroughfare to the applause of tens of thousands of spectators.